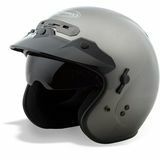 Hank - Yelm, WA Versatile helmet "The helmet fits a tight, but I expect it to fit better after a longer break in time. I was hoping it would be a little warmer for the cool morning rides. Air moves in from underneath, but that helps keep you cooler when it warms up. The visor is very clear, and shaped in a manner that does not warp your vision. Overall I am happy with the purchase." Atom the ant - Tucson Great looking Helmet "I bought the red color helmet, it make me look like Atom Ant without the antennas. 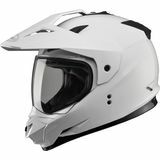 It is a nice quality helmet I went by the sizing chart it said my head was small, I kind of wish I had got the medium as the small a little too snug, but as it breaks in it may loosen up enough"